LOS ANGELES, California, May 7, 2012 (ENS) – Eight U.S. and German automakers have agreed to utilize a fast-charging technology that recharges EV batteries in just 15 to 20 minutes. Audi, BMW, Chrysler, Daimler, Ford, General Motors, Porsche and Volkswagen have agreed to support a harmonized single-port fast charging approach – called DC Fast Charging with a Combined Charging System – for use on electric vehicles in Europe and the United States. Live charging demonstrations of the new system are on view during Electric Vehicle Symposium 26 in Los Angeles through Wednesday. The combined charging system integrates one-phase AC-charging, fast three-phase AC-charging, DC-charging at home and ultra-fast DC-charging at public stations into one vehicle inlet. This will allow drivers to charge at most existing charging stations regardless of power source. The automakers hope the new technology may speed more affordable adoption of a standardized EV charging infrastructure. The International Society of Automotive Engineers has chosen the Combined Charging System as the fast-charging methodology for a standard that incrementally extends the existing Type 1-based AC charging. The standard is to be officially published this summer. The European association of vehicle manufacturers, ACEA, has also selected the Combined Charging System as its AC/DC charging interface for all new vehicle types in Europe beginning in 2017. “The system will optimize customer ease of use and will accelerate more affordable deployment of electrified vehicles and charging infrastructure,” said Ford in a statement announcing the technology agreement. The charging system design was based on collaborative reviews and analysis of existing charging strategies, the ergonomics of the connector and the preferences of customers in the United States and Europe. Today’s electric vehicles, such as the Ford Focus Electric, can recharge in four hours with a quick charger, but from 2014 EVs will be able to recharge much more quickly. The Combined Charging System was developed for all international vehicle markets and creates a uniform standard with identical electrical systems, charge controllers, package dimensions and safety mechanisms. “The system maximizes the capability for integration with future smart grid developments through common broadband communication methods regardless of the global location of the charging system,” General Motors said in a statement. The combined charging approach will reduce development and infrastructure complexity, improve charging reliability, reduce the total cost-of-ownership for end customers and provide low maintenance costs, GM said. 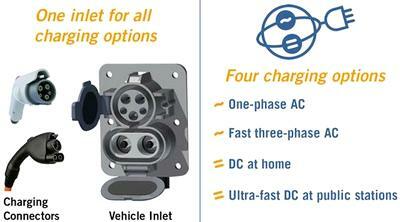 All eight automakers have vehicles in development that will use the Combined Charging System. 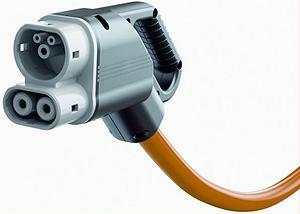 Chargers will be available commercially as of the end of 2012 and vehicles using the technology will be available starting in 2013.